Hear from us about the latest things we’re working on! While Michael has been working on the multiplayer overhaul of Torus Syndicate, I’ve been working on creating new music for the levels. Work on that front has been especially interesting, as we’re experimenting with music that matches the intensity of the gameplay. In many of the levels, the soundtrack contains a low-intensity version, as well as a high-intensity version. This makes sense in the context of the game, as the intrepid “Bros” face larger and more deadly threats the deeper they venture into an area, culminating in a dramatic, old-school boss battle. By keeping the same theme but increasing the intensity of the soundtrack, we are able to indicate to the player that the stakes have been raised non-verbally. Often times, the inclusion of a system involves the development of various auxiliary features that serve to support the overall goal. This is specially evident for dramatic changes, such as the inclusion of multiplayer. This week, we’ll delve a little bit into one of these systems, the player’s avatar. Previously, players didn’t have a visible body as there was simply no need for it. 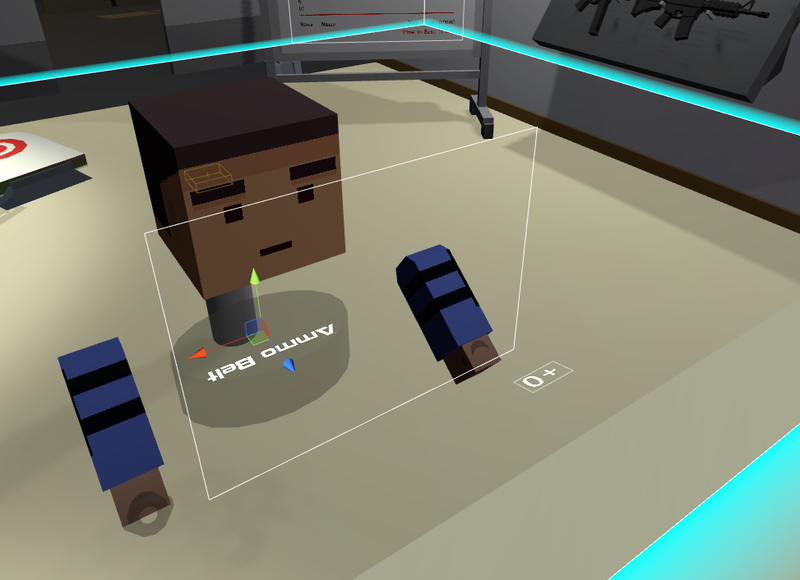 However, now that a 2nd player exists, players must be able to see each other as fellow police officers, as opposed to the floating guns that we’ve been using. We’d also want to make the player associate themselves with the avatar, so the avatar should follow the player’s motions wherever possible. This is uniquely possible within VR, as we have positional data regarding the player’s hands and head. It’s not enough to reconstruct the entire body, but we can make some approximations such that we end up with a believable result. The next step is to add the rest of the body. Without additional data, we can, to some degree, make some assumptions about the character’s body. By approximating the body as a mass hanging from the head connected by a hinge, we have a reasonable approximation of the body’s position in most standing situations. We think the addition of the Avatars will bring alot of immersion to the gameplay experience of The Torus Syndicate, and have already started adding various places where the player can see themselves. See you on next week’s update! As we’ve mentioned recently, development of cooperative multiplayer is underway. In time, Lucas Lawson will no longer have to face the thugs of the Torus Syndicate alone. Right now, we’re focused on giving Lucas an AI friend to help him with that task. Now, yes, the ultimate goal is full-fledged support for playing alongside other real humans, but this is a critical first step in building out actual multiplayer support as efficiently as possible. For example, we’re also concurrently working on Act II. The AI ally will function as a stand-in for a human one, allowing us to build the act specifically with multiplayer in mind without having to first complete multiplayer itself. It will also enable us to experiment with different aspects of the multiplayer experience earlier on, when it’s easier to learn and make decisions. Altogether, the mere fact that Lucas is getting a partner is a game changer, regardless of whether its human or robot; getting that into the game as soon as possible will let us develop smarter. It’s good to have an AI friend who has your back. Especially if he’s a good shot. However, we think there’s another good reason for the AI ally: it’ll make the game more fun and push it closer to the arcade-likeness we’re trying to imbue into the game. Human allies will be able to seamlessly drop into in-progress games, simply replacing the AI ally. They’ll also be able to drop out without ending the game; the remaining partner can simply continue with the help of the computer. The ever-present ally will also open up new opportunities with the storyline. In the end, Lucas Lawson needs all the help he can get to take on the syndicate, and we think our players will appreciate that help, whether it comes in the form of a real human or an artificial one. One of the most important metrics to us when developing a new feature is how malleable it may be; That is, whether the feature is able to support multiple styles of play based on changing a few key rules. It is the foundation of what we think of as strong game design, and we’ve spent a large amount of design time considering these possibilities. Take the node based Curated locomotion system, for example. We create an “On-Rails” style experience using this method, where we take the player from one position to the next. It is a refined component of our game,works reliably, and our players are familiar with it. Then, in the second level, we introduce the Multi-node experience, based off the single node experience described above. By changing the node’s next destination from one node to multiple nodes, we create a more free form, yet still controlled experience that plays differently. With Act 2, we are adding an optional but potentially interesting style of play; Stealth missions. Equipped with a silenced weapon, players have a limited amount of time during encounters to engage and defeat the unaware enemies, or end up fighting against a more aggressive, alert group instead. Players can still go in guns-blazing, but for the more tactical minded, these missions offer an easier path for those who take on the challenge. 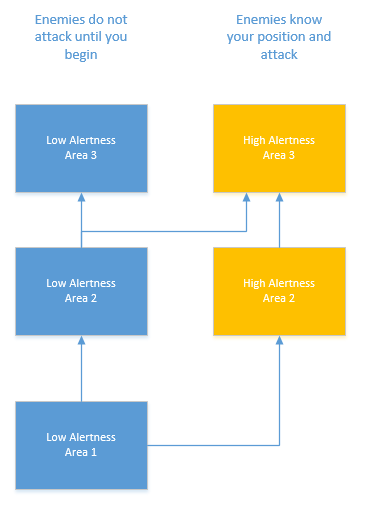 This is once again made possible by simply rearranging the nodes into a different structure, this time, two parallel and interconnected lines, with each line representing a different alert level. This creates a simple but radical change to the gameplay, and serves to offer something that plays a little differently. We’ll have more to show on the missions in the coming weeks, stay tuned! We’ve always thought of The Torus Syndicate as a manifestation of our love for the kinds of rail shooters one would find in the video arcades of yesteryear. From the very beginning, we really wanted to capture the subtle relationship between motion and action that forms the genre’s hallmark. We think that the game, as it stands now, incorporates that essence while bringing it into the 21st century as a fully immersive VR experience. However, another big part of the style — and, really, arcade games in general — is the social aspect. As good as The Torus Syndicate may be now, we can’t call it a faithful addition to the on-rails world without multiplayer. But we do have some good news; that’s exactly what we’re working on now. Our goal is to build out the game’s campaign with full support for cooperative multiplayer. No longer will Lucas Lawson have to fight alone; instead, two players will be able to team up to take on the Syndicate. We have some interesting ideas involving AI allies and seamlessly transitions between the single-player and cooperative campaign to help ensure that players can more readily find an partner to jump in with. The first task, however, is to retrofit the current game for multiplayer use. That means updating Act I to support two good guys side-by-side and adjusting the current backend code to operate over a network. One of the biggest tasks, however, is to figure out what Lucas actually looks like in game. As you can see below, we definitely have some work to do on that front. There’s something off about Lucas, shown here as a simple white capsule shooting at an enemy. Is it because he doesn’t appear to actually have a gun? Or is it something else? Keep an eye out for later updates as we work to build out multiplayer and cement The Torus Syndicate’s place as one of most faithful and enjoyable adaptations of an old play style for virtual reality. In The Torus Syndicate, Lucas Lawson must fight across an urban landscape to bring down the syndicate’s thugs and restore order to the city. Everywhere he goes — every turn he makes — he faces unknown foes ready to respond with force. Of course, the dangerous criminal underworld won’t be as mysterious to return players, who’ve seen the plot unfold and know what dangers lie ahead. In building the game’s mechanics, we sought to minimize that loss of mystery, to try to keep the game unpredictable and make sure veteran players stay on their toes. Aspects of the campaign are, for example, randomized; players will note that different enemies stand in their way and behind different cover across each playthrough. The best example, however, lies in the newly released Survival Mode. Survival Mode may look fun, but it’d be way too boring if you could predictably pick off each enemy every time, like above. Fortunately, we’ve though of that. In Survival Mode, the game places the player near the docks from the second campaign level. It then throws wave after wave of bad guys at them, and it’s the player’s job to last as long as they possibly can. Unscripted behavior is key. We can’t script an infinite number of waves and, regardless, we need each wave and each playthrough to feel new. Our solution is twofold. It doesn’t have a name, but, if I had to give it one, I’d call it something like the Budgeted Sector-Front system. The first part of creating a wave is deciding which Syndicate agents to send out, and that’s exactly what the Budgeted part of the system sets out to do. The difficulty of a wave is primarily decided by the number of enemy agents and their type: one basic thug does not equal one sharpshooter. To control both factors, each wave is given a budget, with later waves receiving a larger one. Each enemy type is given a cost. The game then randomly builds a wave by “buying” agents until it exhausts its budget. The end result is a wide variety of waves. Some might contain only many basic, weak units. Others might feature a smaller number of elite units. Still others might have a mixture of the two. Consequently, each playthrough has a similar difficulty curve with enough variability to keep the player challenged. However, the difficulty of a wave goes beyond a simple roster of units. A few sharpshooters, for example, might be easy to handle when they’re bunched together but pose greater danger when they come at the player from all angles. The Sector-Front part of wave construction is responsible for ensuring that the placement and movement of enemies is varied enough to keep the player guessing without being overwhelmed. The docks are chock-full of cover, which are split into a ring of several sectors. A Survival Mode game starts with just one front — that is, just one continuous stretch of cover-sectors. As the enemy budget is consumed, the front grows into adjacent sectors to accommodate new agents. The agents still randomly choose their cover within each sector, and the front itself is randomly placed as well. However, confining the agents to a block of adjacent sectors helps to control the challenge posed by the agents’ positions. When the player has demonstrated their mettle, another wave is opened up. The agents attack from more angles, and surviving gets harder. As a result of this wave construction process — through the combination of an agent budget and the consolidation of cover into well-defined fronts — each game of Survival Mode provides a consistent difficulty curve without sacrificing replayability. Each playthrough is different enough that even the most veteran of players will be forced to think on their feet to survive. And, ultimately, that’s what Survival Mode is all about. Coming back to the office after the holiday festivities, we started work on Act 2’s story, which starts in a seedy Diner where you meet Alexa, an intelligence officer at the precinct. The outside of the Diner is shown above. 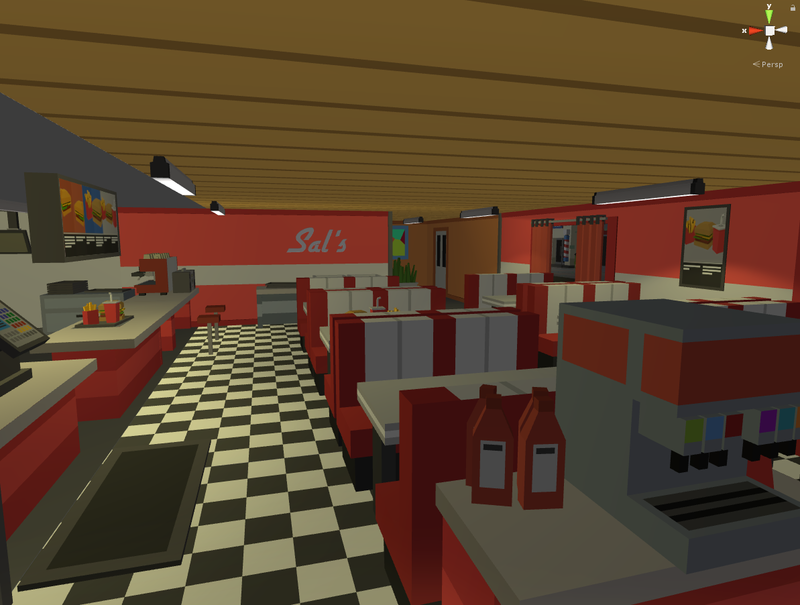 As we mentioned before about world building, it is important for the player to understand the relationship of the Diner as it pertains to the rest of the world. 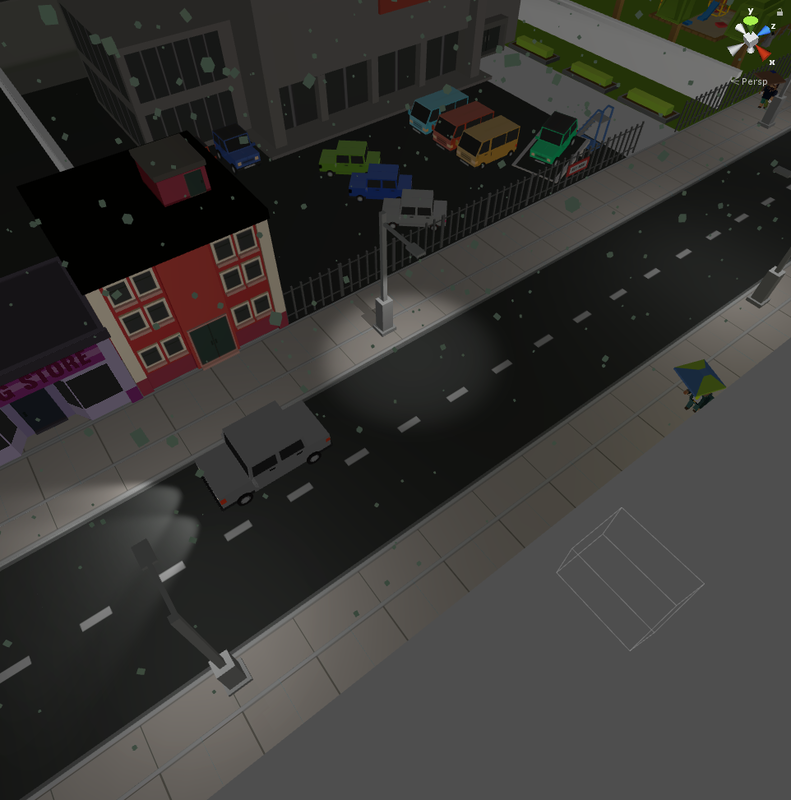 We put the diner next to the sidewalk, where we show the player glimpses of the outside space through some windows. To create a believable rainy scene, we added rain particles that collide with the world geometry, bouncing off various objects and people in a realistic manner. We also added cars and pedestrians to create kinetic motion in order to encourage exploration of the outside through those windows. Finally, we added sounds of rain, and dramatic lightning that floods the diner to tie the inside of the diner to the outside. The inside of the diner is designed to contrast the dark uninviting tones of outside; Warmer colors, and ample lighting, and talking people contribute to the idea of the diner being a safe space, which is similar to the Police briefing room in Act 1. Putting these two areas together creates a scene that invites exploration. Much of the effort in building The Torus Syndicate went and still goes into making as immersive a world as possible. We noticed that, in doing so, our focus has been particularly drawn to motion. We’ve already talked at length on how we developed the mechanic that players use to move around, Curated Locomotion, and how critical we believe it is to drawing players into our world. The player’s motion, though, hasn’t been the only motion of our concern; the player’s enemies have had their fair share of attention too. I’m particularly proud of the flying drone, one of our more recent additions to the game. They play a key role in the third, rooftop level, and I think their addition to the new survival mode really added a whole new dimension of fun. The drone is special compared to all its brethren not just in that it flies but also in how it’s modeled: its motion is the product of a realistic physics simulation. Enemy drones fly and crash realistically, which is probably of little comfort to the Torus Syndicate thugs operating them. The drone has real physical properties, such as mass and drag. When the NODE AI Director sets the drone’s destination, its autopilot computes the desired thrust and overall torque that its motors need to produce to push the it there. If the engines stop working (because, say, the player has thoroughly damaged them), the drone, like any of its real-world counterparts would, loses thrust and comes crashing to the ground. What’s particularly cool about this setup is that at the core of the drone’s autopilot lies a PID controller that’s responsible for maintaining the motor’s output so that the drone stays on track. That term might not mean much to anyone who’s not a control system engineer, but PID controllers are used in the real world to run all sorts of systems, including some very real drones. It may not be the first thing on a player’s mind when they’re dodging the bullets coming from an in-game drone, but it’s these small details that add up and help us make the virtual experience of playing The Torus Syndicate feel as real as possible. In our continued exploration of the VR/AR space, it became increasingly evident to us that in many VR applications, the player is spending the majority of their time getting face-to-face with other players or NPCs throughout. As most VR applications use a first person view system, this is more or less expected; The different is, of course, that instead of taking up the space of less then an inch on your monitor, character faces now take up a realistic portion of real estate in the player’s vision. 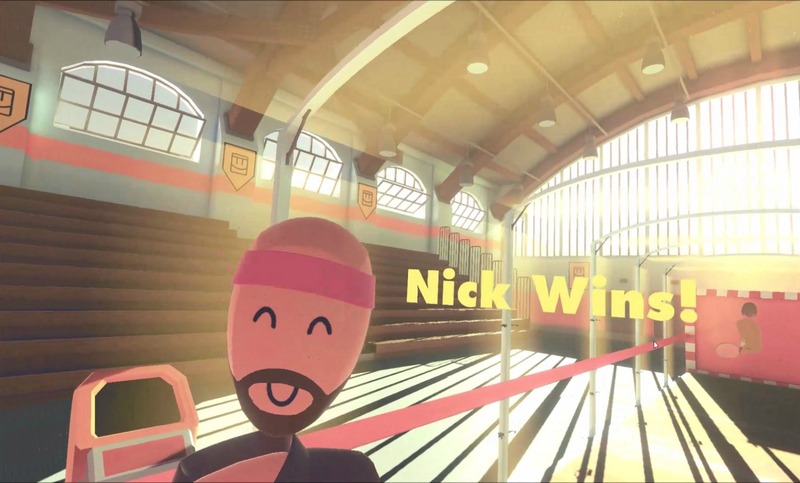 The players in Rec Room seems to randomly change faces based on a mixture of activities, creating an emergent story that ends up being hilarious. Invasion! 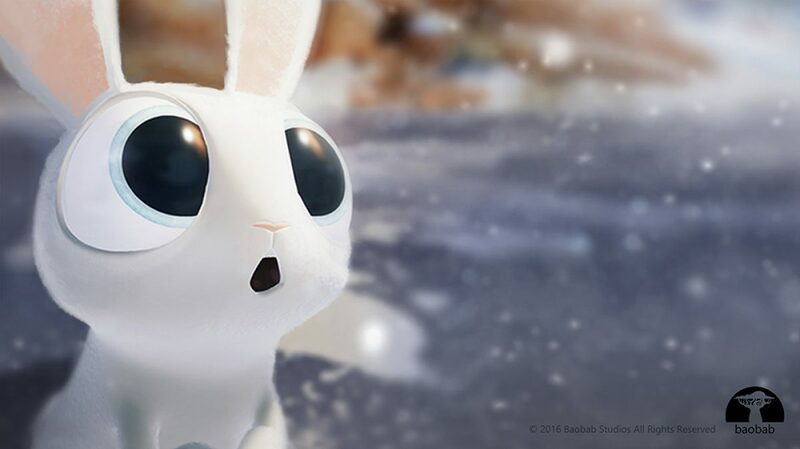 from Baobab Studios uses this expressive bunny to convey the tone of your encounter with the third kind. Due to this closeness, it becomes painfully evident whenever characters have static, emotionless faces. Immediately, the interactions become robotic, and the illusion of NPCs being real quickly falls away. Since we are dealing with humans in The Torus Syndicate, we decided that the NPCs the players interact with should have some level of animation. By Extracting the eyes and mouth off our character textures, we converted them to sprite sheets, which was then re-introduced to the character as a series of faces that can be changed programmatically.